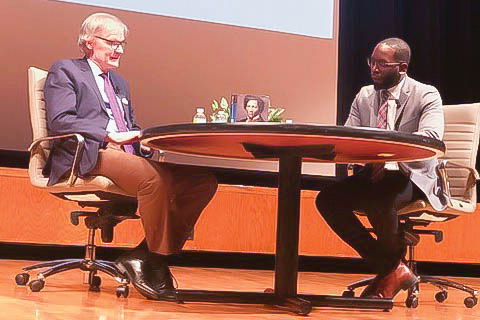 Author and professor David Blight said at a discussion at Evanston Township High School on Friday that he struggled to portray a different side of Frederick Douglass because of the powerful narrative Douglass himself constructed in his autobiographies. Blight, a history professor at Yale University, spoke about his newest book, “Frederick Douglass: Prophet of Freedom,” which explores Douglass’ life after the Civil War. Family Action Network, a group that organizes a speaker series for the greater Evanston area, hosted Blight as part of their programming. “Frederick Douglass: Prophet of Freedom,” was a Wall Street Journal, Time and New York Times Top 10 book of 2018. Blight has written 16 other books and received awards including the Frederick Douglass Book Prize and the Connecticut Book Award for non-fiction. Marcus Campbell, the assistant superintendent and principal of Evanston Township High School, interviewed Blight. The two began the evening by discussing the Walter O. Evans Collection, a series of documents that inspired Blight’s book. The collection primarily consists of about 10 family scrapbooks that contain thousands of newspaper clippings, family letters and documents. Douglass’ sons kept them, and Blight was one of the first historians to use them for research. Blight’s most recent book took him 10 years to finish, and he said his writing process is always idiosyncratic, not just moments of pure inspiration. Blight said he starts his day by reading a secondary source about his subject to get in the right headspace, and then revises the work he did the day before. However, he said his physical space is just as important as his mindset. Jeffrey Mullins, a 26-year-old Skokie resident who attended the event, was familiar with Blight’s work from his time at Howard University. He said he was excited to read the book and was impressed by the presentation. Evanston resident Alyce Barry serves on the board of the Organization for Positive Action and Leadership, a nonprofit based in Evanston that helps ensure racial equity is a priority for people in positions of power. Because of her role as an activist, Barry said she has read several books about Douglass and is looking forward to reading new material.